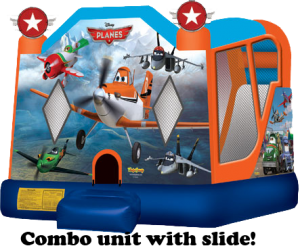 Here is another Brand New Bounce House with Slide Combo. 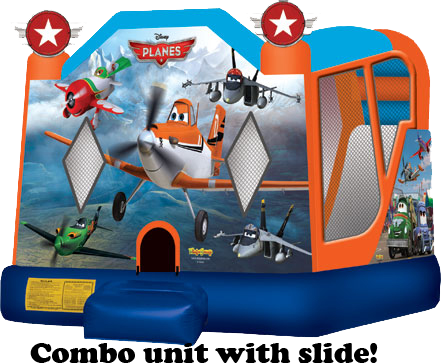 With the Disney Themed “Planes” featured on the front of this bounce House inflatable combo, your kids are sure to be super happy. This inflatable rental option is an excellent choice for any birthday party rental, school function and general block party moonwalk rental. Kids really enjoy the fun themed on the outside, the extra Large jumping area on the inside and the Super cool slide which is also featured on the inside of this unit. This bounce house combo can also be rented with water attachments for a slippery cool way to have fun in the sun. Must request water option separately, additional charge could apply. This Bounce Combo is in perfect condition with no flaws and like new all around.